I've run Benoit Duflos Moth-Pop design thru my hull software. The result is close but not exactly to Duflos' original plans. I've changed the original stations somewhat. Stations 1a, b, c, d, and 8e from Duflos' plans remain mostly the same but I've put other stations in new positions. 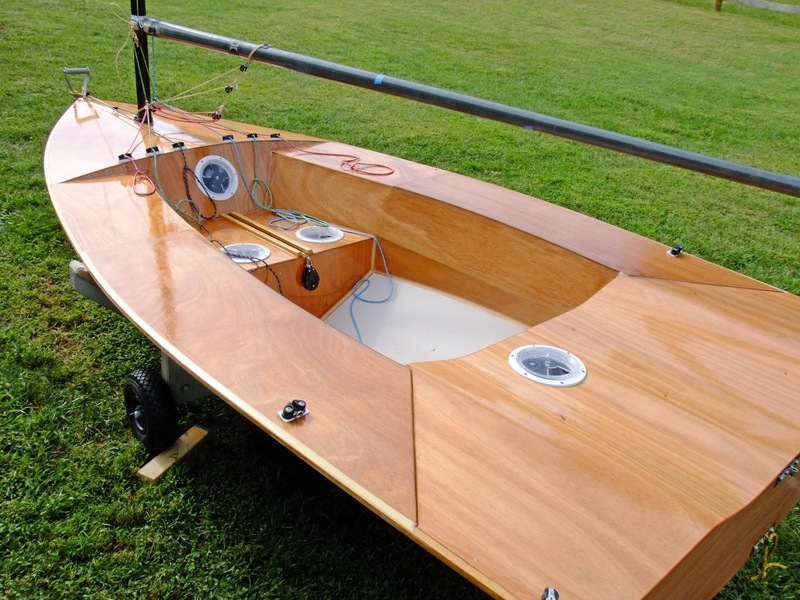 You could use all these frames in a build if you wanted a stiffer but heavier hull. 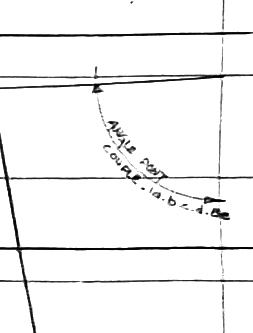 For reference, in the section drawing below, waterlines are spaced at 60 mm (except for the first one above baseline, which is 30mm), and the buttocks are spaced at 150 mm. Below is the .DXF file. Use the pop-out icon to open the file in another browser tab to download for use in a CAD program. Dimensions in the .DXF file are in meters. Here are the offsets in mm. In the Moth-Pop Duflos designed a positive curve in the topside panel to improve stiffness. I've designated that point as the Top Side Bump-Out. There are also some points in the aft stations to mark out the bottom panel curvature. Born to be Mild from Aeon Video on Vimeo. 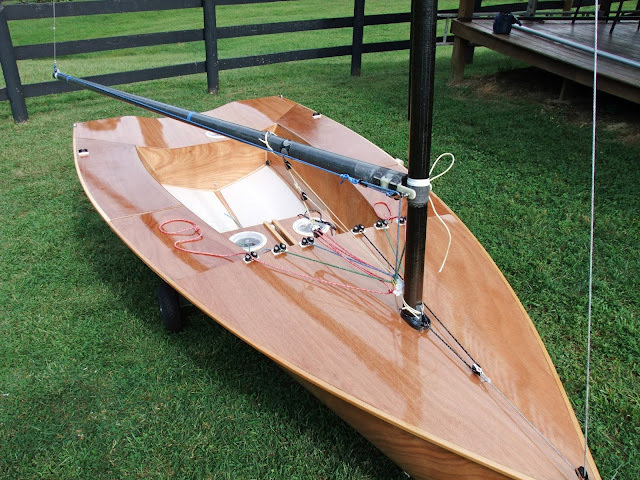 John Z. put on a late summer push to get his Mistral Classic Moth build finished for the E-City Nationals in mid-September. I went over to his place to take some photos as he screwed in the last fittings. John has installed a 16:1 cascading vang. 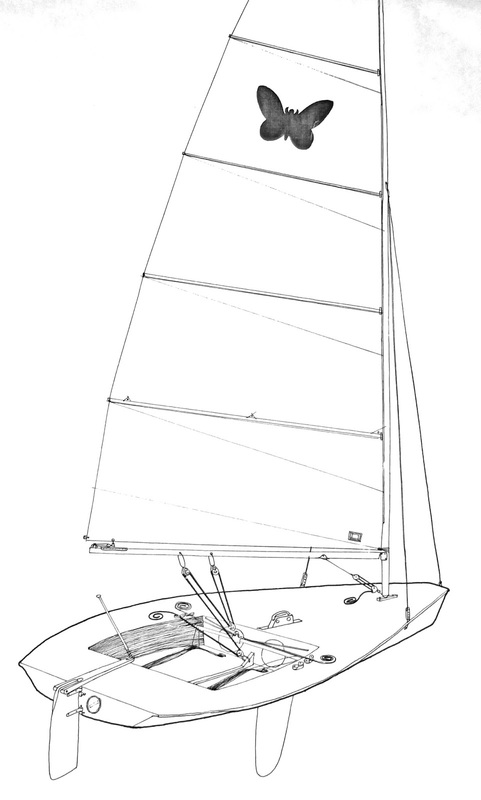 The carbon mast is free-standing with a forestay which provides positive rake control. 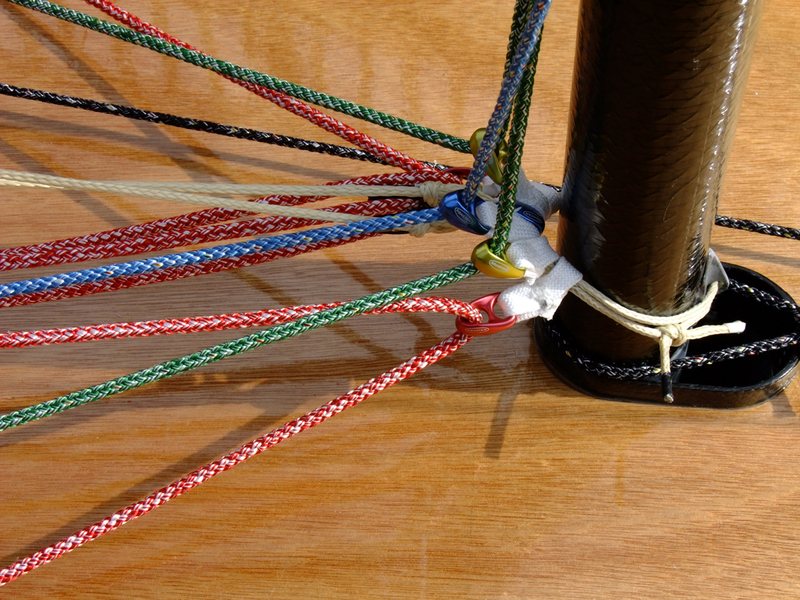 John used the Ronstan sheaveless blocks for his leads at the base of the mast. Simple and light. I pulled the strings a bit and they seemed to slide fine. John doubled up the ply in the seat area to support him crashing around and sitting down heavy on the tacks. 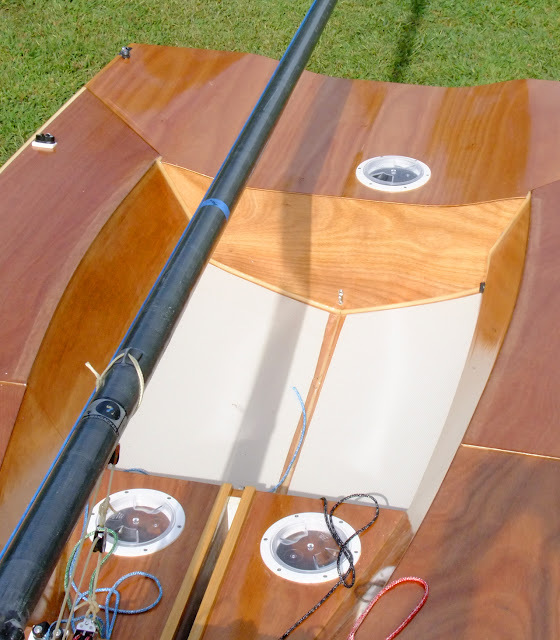 The carbon boom was a discarded carbon oar from a rowing shell. 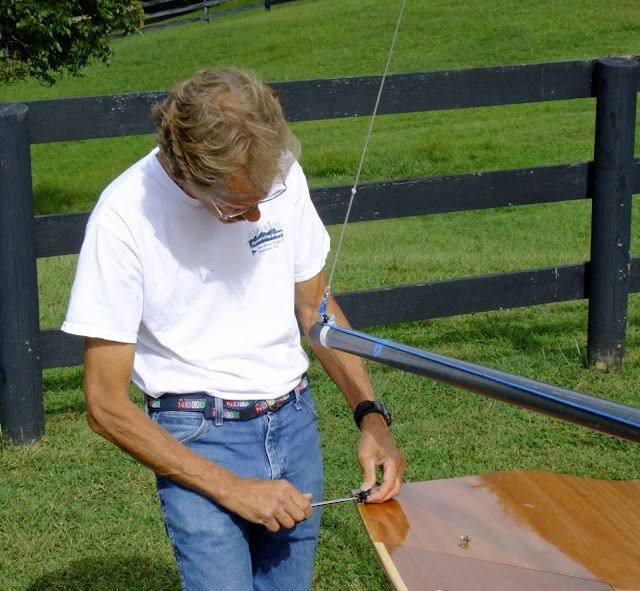 John glassed some ears on the boom and then attached it with a through bolt on the mast. 2:1 on the outhaul is external. John used foam deck pieces from the SUP crowd for his non-slip in the cockpit (comfortable for knees as well). John Z., the builder, with his new Moth now in the daylight, putting on the eyestraps for the traveler. Music Whenever: Pearl Charles "Phases"
Great voice, great lyrics and pedal steel - what's not to like? Detailed dimensions of the Moth-Pop Moth Classique are in Part 1 of this series. A computer rendering of the Moth-Pop can be found in Part 3 of this series. Here is a short PDF showing the construction details of building the Moth-Pop upside down over the flat deck. Use the pop-out icon on the top-right corner to put the PDF file into another tab on your browser. From there you can print or download. Construction details for the Moth-Pop can be found in Part 2 of this series. I have taken a couple of JPEG's of the plans which can be viewed or downloaded. Use the pop-out icon on the top-right corner to put the image into another tab on your browser. From there you can print or download the file. Stations b, c, d and bow transom (1a) and regular transom (8e) are the bulkheads that Moth-Pop is built around and stay with the hull after completion. The bulkheads are set up on the flat deck with a backwards angle (angled towards the transom) as shown by the arc Benoit has drawn at section 1a. 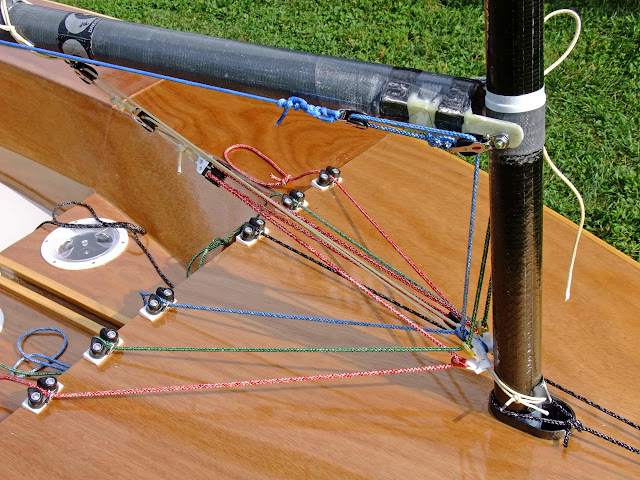 This is to keep the bulkheads perpendicular to the design waterline. All dimensions are in cm. (mm are indicated as a superscript to the cm dimension) unless it is a single digit, which is mm. Below is an iso view of the underside of the Moth-Pop deck. Benoit has the builder plot the sheer and cockpit dimensions on the flat piece of plywood deck before placing the bulkheads upside down. The section plans. Note how the bottom becomes an arc as it transitions toward the transom. Benoit has written the metric dimensions on the plans which can be viewed when zoomed in. A closeup of the angle of bulkheads when placed on the flat deck.